Regimental Fire & Fury: A well done book! 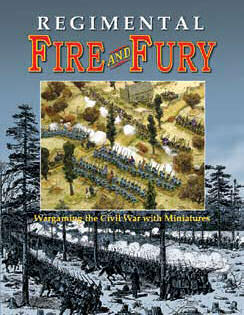 After years of preparation and perhaps the most significant playtesting in wargaming rules history, Rich Hasenauer has published his long awaited Regimental Fire & Fury rule set. I have been a long-time devotee of regimental Civil War gaming, having started in college with home-grown rules and graduating after that to Scott Bowden’s Stars and Bars before getting a hand-typed copy of a set of rules from an early Origins that grew into Johnny Reb. I have played dozens of ACW systems of various scales over the years, with my favorites being Johnny Reb 3, Fire & Fury, and Brother Against Brother. I was involved in a few playtests of RFF at various conventions, including Historicon and Cold Wars, and came away interested in the system for its simplicity and ease. Hence, I have watched Rich’s progress with interest, and wargamers such as Lowell Hamilton have worked diligently to translate the Johnny Reb scenarios I publish in the hard copy version of CHARGE! into RFF format. I have asked Lowell to write an article for an upcoming issue on how others can make similar conversions, because there are hundreds of JR-type scenarios out there that can be used for the new RFF rules with a little effort. New ACW regimental level scenario book now available! Brad Butkovich is perhaps the most prolific Civil War scenario designer in the hobby today, with a style that is both entertaining for gamers and historically accurate. 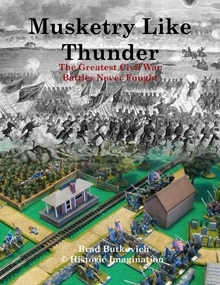 Well researched for factual history and well balanced for playability and enjoyment, Brad’s efforts in Musketry Like Thunder: The Greatest Civil War Battles Never Fought are superb and well worth downloading for a modest fee to your PC, where you can then print the scenarios you want to play (or the entire book, of course). His latest effort is a fascinating compilation of eleven hypothetical settings and battles that offer some unique and interesting challenges to the gamer. He has graciously adapted one of them, “Surprise in the Forest,” for re-publication in the November issue of Charge! newsletter exclusively for the Johnny Reb Gaming Society. Here is some verbiage from the Wargames Vault regarding this new .PDF book. “This book provides eleven fictional scenarios, from small introductory games to corps level actions. Each provides a unique tactical problem often encountered by the armies fighting the war. These range from command and control issues, surmounting difficult terrain, to combating the weather as well as each other. In addition, each scenario has great replay potential. Federals and Confederates can switch deployment areas, and you can modify the order of battle to represent different years during the war. In fact, you can use the maps and deploy entirely different forces on the table! Three huzzahs for Brad! We look forward to many more similar products in the future from Brad! 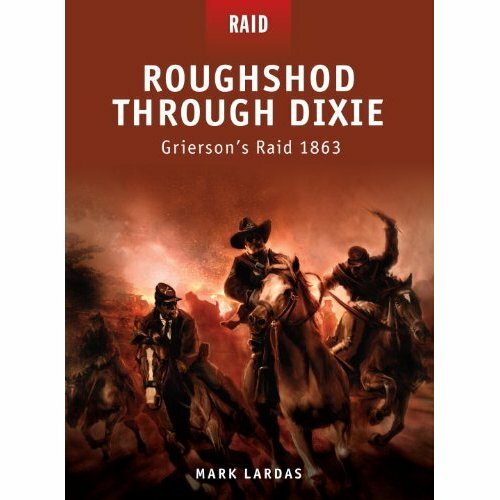 The good folks at Osprey Press have released their latest Civil War book, this one nicely outlining Benjamin Grierson‘s lengthy cavalry raid in April and early May 1863. Grierson, commanding a force of about 1,700 cavalrymen, departed Union lines in LaGrange, Tennessee, and headed south. Six hundred miles later, they arrived at Union-held Baton Rouge, to the astonishment of the troops there who had no clue such a daring raid was in progress. Along the way, the Yankees destroyed 50 to 60 miles of railroad track (at a time Confederate resources to repair them was declining). Grierson’s raiders also burned several railroad bridges and culverts, and wrecked the telegraph system along their path. At times traveling as much as 36 hours straight without significant sleep, the weary command completed one of the most daring raids in U.S. military history after 17 days in the saddle. They triumphantly paraded through the streets of Baton Rouge to the cheers of the local garrison and pro-Union civilians. The raid formed the background to the old John Wayne classic film, The Horse Soldiers, which was a staple for me growing up. I loved the movie, perhaps more than any other Civil War movie of my youth. I used to recreate the raid in my sandbox using my 54mm toy soldiers. Now, Osprey has produced a slick, colorful book that adequately describes the basics of this mounted incursion into the Cotton States. The text, written by Texan Mark Lardas, flows easily and is well written. He believes Grierson’s Raid demonstrated that by then the Confederacy was a “hollow shell,” incapable of adequately protecting its citizens or significantly impairing Union movements. Grierson forced the Rebels to reposition thousands of troops away from the front lines at Vicksburg in a futile effort to stop him. The Pittsburgh native would repeat his success a year later with another long raid, and Union armies would follow up with strikes into the Deep South that essentially ended the war in the Western Theater for all practical purposes. Available from amazon.com and many leading military and hobby retailers, Roughshod Through Dixie should be on your summer reading list. The twelfth in Osprey’s RAID series, this book is perhaps their best effort to date. The digitally produced artwork is at their normal high standards, and the narrative is crisp and informative. 15mm Mill Springs game presented by Tom Ballou of Battle Group Boston. This game was re-run three times using different rules each time — Carnage & Glory, then Johnny Reb 3, and finally They Couldn’t Hit an Elephant. Here is a photo of my miniature wargame I presented today at the annual Historicon miniature wargaming convention (this year at the Valley Forge Convention Center after years in Lancaster PA). The 15mm wargame is of a portion of the Union attack on Missionary Ridge near Chattanooga, Tennessee, in late 1863. Phil Sheridan’s and Thomas Wood’s divisions of Gordon Granger’s corps attacked John C. Breckinridge’s Confederates atop the steep and high ridgeline. Valley Forge was awarded this year’s convention after plans to go to the Baltimore Convention Center in the famed Inner Harbor fell through. The ride over from York this morning was fine on I-76; about an hour and 45 minutes and $3.20 in tolls each way.